Ease: Applying a style is easier than manually applying formatting. And changing the formatting is a snap. If you want the headings to look different, for example, you can modify the Heading 1 style to change them all at once. Consistency: You don’t have to worry about all the headings being formatted consistently; because they’re all using the same style, they’re automatically all the same. By default, each paragraph is assigned a Normal style. The template in use determines the styles available and how they’re defined. 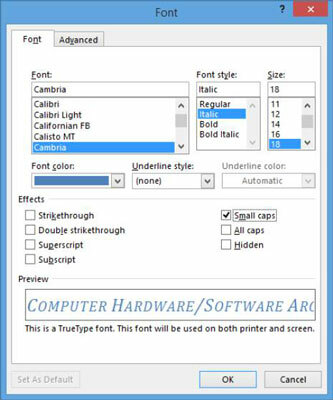 In Word 2013 documents that use the default blank (Normal) template, the Normal style uses Calibri 11-point font and left-aligns the text, with no indentation. You can redefine the styles in a document and create your own new styles. The Normal template, on which new blank documents are based in Word, contains some basic styles you can use to get started, such as Heading 1, Heading 2, and Normal. To see what styles are available in your current template, start on the Home tab, where you find a Styles gallery. The first row appears on the Ribbon itself, and you can see the rest of it by clicking the More button to open the full gallery. The Styles gallery on the Home tab contains shortcuts for commonly used styles. Not all styles appear in the Styles gallery — only the ones designated to appear there in their definition. The rest of them appear only in the Styles pane. To open the Styles pane, click the dialog box launcher on the Styles group. To apply a style, select the paragraph(s) that you want to affect, or move the insertion point into the paragraph. Then click the style you want to apply, either in the Styles gallery or in the Styles pane. If a keyboard shortcut is assigned to a style, you press the keyboard shortcut to apply the style, too. 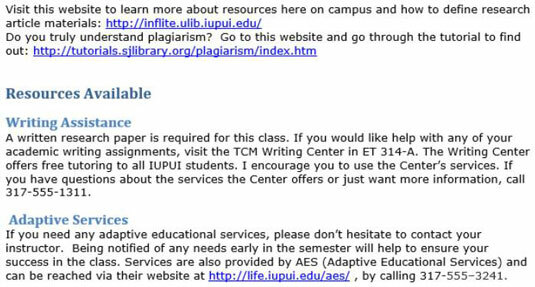 For this example a syllabus will be used and referenced. Click in the first paragraph (CIT 233, in the example). Then on the Home tab, in the Styles group, click the More button to open the Styles gallery. The style is applied to the first paragraph. Using the same procedure as Steps 2 through 3, apply the Subtitle style to the second paragraph. Apply the Heading 1 style to each of the orange paragraphs by clicking Heading 1 in the Style gallery. Here’s a shortcut: Click to the left of the first orange paragraph to select it, and then hold down the Ctrl key and do the same for each of the remaining orange paragraphs. After they’re all selected, apply the style to them all at once. Click the dialog box launcher in the Styles group to open the Styles pane. Scroll through the Styles pane and locate the Heading 2 style; then click in one of the green paragraphs near the end of the document and click the Heading 2 style in the Styles pane to apply it. Apply the Heading 2 style to all the remaining green paragraphs. The last page of the document resembles the finished product. Most of the styles in the Styles pane have a paragraph symbol (¶) to their right. This means that they are paragraph styles — they apply to entire paragraphs at once. They may include both paragraph and character formatting in their definitions, but if you click in a paragraph and then apply the style, the style will be applied to the whole paragraph. In contrast, some styles may have a lowercase a to their right on the list; these are character styles, or text-level styles, and they apply only to the text that you select before applying them. A character style can contain only character-based formatting. You can modify a style in two ways: by example or by manually changing the style’s definition. The by-example method is much easier, but somewhat less flexible. The following exercise shows both methods. Triple-click the document subtitle (the second paragraph) to select it and then change the font size to 18 points. In the Styles pane, click the down arrow to the right of the Subtitle style, or right-click the Subtitle style. 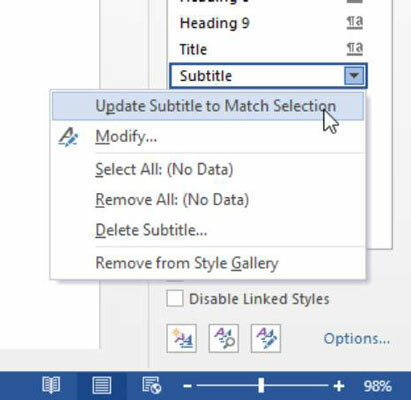 In the menu that appears, choose Update Subtitle to Match Selection. The style is updated with the new font size. Reopen the Subtitle style’s menu and choose Modify. 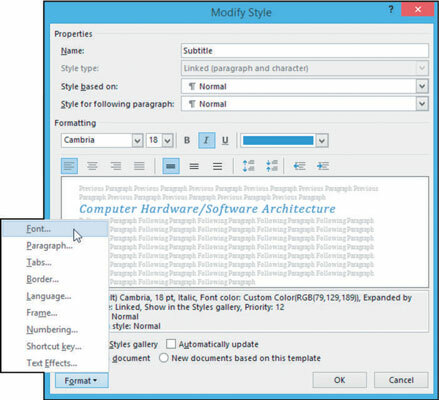 For more practice, make other changes to the style’s definition using the font controls in the Modify Style dialog box. The buttons and lists in the dialog box correspond to the tools in the Font and Paragraph groups on the Home tab. In the bottom-left corner of the dialog box, click the Format button and choose Font to open the Font dialog box. Select the Small Caps check box, and then click OK to return to the Modify Style dialog box. Notice the Add to the Styles Gallery check box in the bottom-left corner of the Modify Style dialog box. This check box’s status is what determines whether a particular style appears in the Styles gallery on the Ribbon. Click OK to close the Modify Style dialog box. The style definition is updated. Because the Subtitle style is used only once in this document, you don’t get to see one of the biggest benefits of styles in this exercise: the fact that when you update a style, all text that has that style applied to it updates automatically. For more practice, change the definition of the Heading 1 or Heading 2 style, and watch all the instances change.